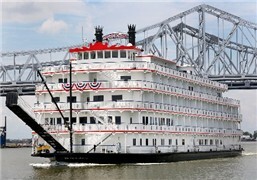 Queen of the Mississippi, the first new paddlewheeler designed for overnight sailing on the Mississippi River in nearly 20 years, debuted this month. Freelance travel writer Deborah Burst was onboard as owner American Cruise Lines provided a quick, sneak peek for journalists prior to the ship's inaugural cruise. Burst provides a look at the ship and its features. Come along for photos of the new river boat and the writer's first-hand perspective.